I had a great deal of honest to goodness enjoyment in putting this painting together. 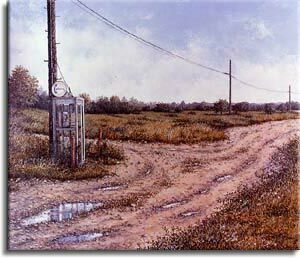 The inspiration for this work began on a side road in Ohio - a lone telephone booth on a corner. True, there were some buildings, a house and barn behind and to the right of it, but, somehow, it struck me as being rather isolated just the same. Weeks later, at home in my studio, I had this same feeling looking at photos of the scene. To further develop my idea, I painted out the background of the photo with some gesso and, there, behold, was the inspiration for my painting' Unfortunately, in this case, I broke my own rule of always taking close-ups, so the details of the booth were rather indistinct. So, out I went again with my camera and sketch pad to find me some phone booths! If you ever want to attract some curious stares from onlookers, just hop out of your car someday and start sketching and photographing a phone booth! You're bound to draw a crowd, as well as the phone booth (if you'll pardon the pun)! Unfortunately, the "old style" phone booths are hard to find nowadays, so I had to finally settle for a brand new model; but, after second thoughts on the matter, I said to myself, "Why not?". Maybe that's even a better way to approach the subject A shiny new phone booth installed out in the middle of nowhere, possibly the only link, the only tenuous line between here and civilization - an "umbilical cord"! Then, after inspecting telephone lines and hookups, I discovered there are various styles of equipment and many different ways that phone booths can be hooked up to poles and power lines. Since I wanted to recreate a country setting with only the sparest amount of equipment required for a hookup in a remote area, I finally decided to visit my local telephone company for the authentic information that I required. A "realist artist", especially one who is attempting to record our "living history" must, I believe, be authentic in details such as these. The telephone company was very cooperative, and three days later I was out in the field with a Field Representative getting the necessary information. Back in my studio, the sketches have now evolved into a final composition, and, after preparing a gesso primed panel and mixing up a batch of egg tempera, I'm ready to paint. Since the telephone booth was a California model, I decided to use my "artistic license" once again and move the scene from Ohio to California - complete with fields of wildflowers, including our very own California Poppy. Because of our recent and incessant drought, the dusty, sun baked dirt road also looked very typically Californian. Then, just as I was completing some finishing touches on the road, it rained! Rain in drought stricken California was indeed a happy event and, for me, an extra bonus for all I could think of as I drove around in my car the next day was how beautiful those rain puddles would look on my dirt road! So, pulling out my "artistic license" once more, (one day I'm sure it will be revoked for overuse! ), I painted into that dusty old road some big, wet rain puddles! Holding a mirror underneath the image of the phone booth, I was able to gauge where its reflection should be in relation to the puddles. Looking through my reference files, I found some photos of rain puddles taken a year or two earlier. These helped me create even more authentic looking puddles! One should always keep a "Morgue" of photos taken throughout the years. It helps to index them, too: "Children", "Water Scenes", "Animals", “Mountains”, etc.